2019 Calendar. A4 size 12 Johnstone Pictures and 12 months of Calendar pages. 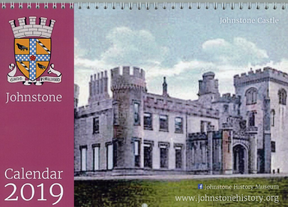 Our Johnstone Calendar has 12 views of the Town for you to enjoy. We'd love to have you visit, but if 'tis a wee bit too far, note our low shipping charge to anywhere in the world.